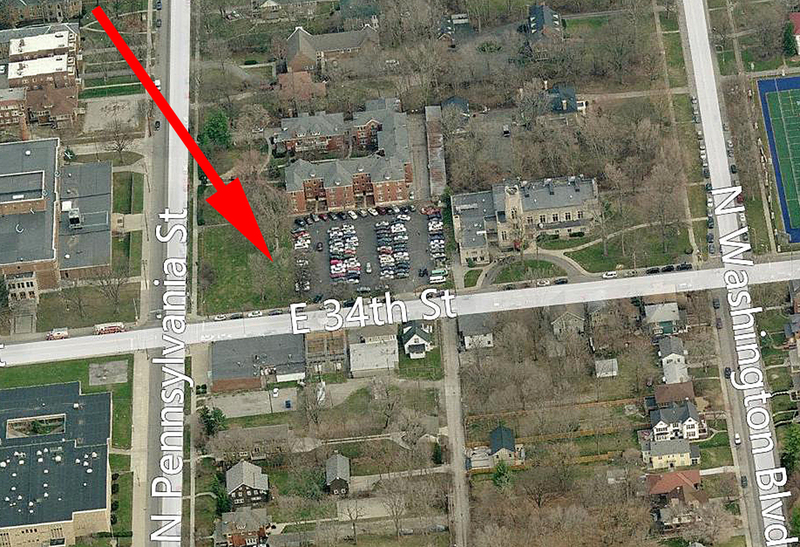 The address of the former residence in which you received music lessons was 3411 North Pennsylvania Street. The property was located on the northeast corner of 34th and Pennsylvania Streets. The home was built in 1913 by Paul Helb White (1871-1946) and his wife Margaret “Daisy” Malott White (1874-1958). 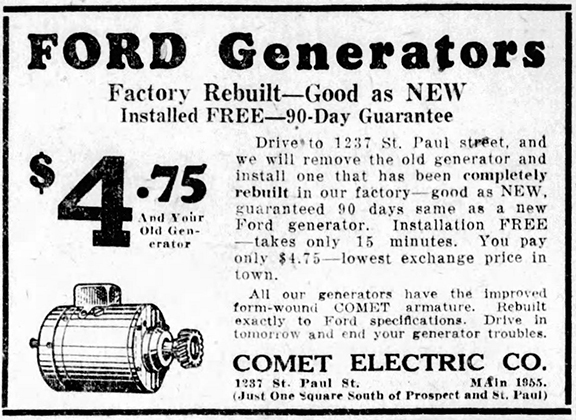 Paul White was the owner of the Comet Electric Company, which manufactured generators, marine lighting sets, truck lighting sets, and magnetos. White was the designer of the first electric automobile made in Indianapolis. His wife was the daughter of prominent Indianapolis banker and businessman, Volney Thomas Malott (1838-1921). In 1928, the Whites sold their fifteen-year-old home to the Arthur Jordan Conservatory of Music. 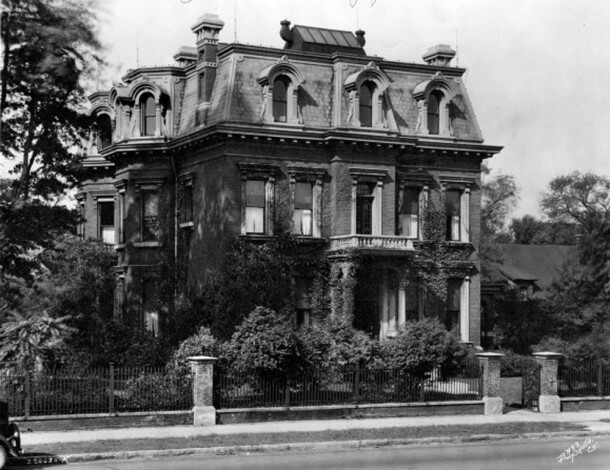 The Whites temporarily moved to a luxurious 10-room apartment in the Winter House at 1321 North Meridian Street, while they had a new home built at 4224 Washington Boulevard. 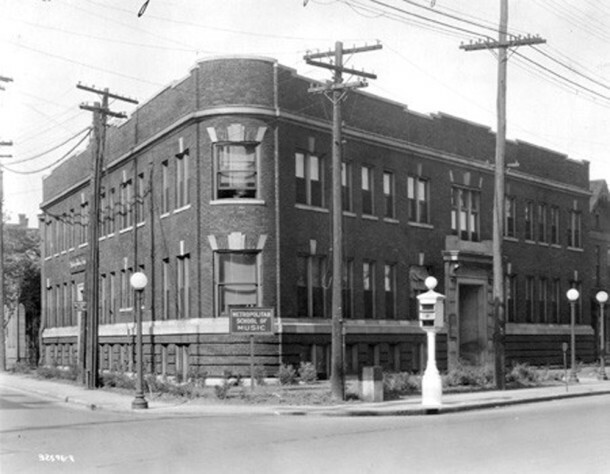 At the time the Arthur Jordan Conservatory of Music expanded to what is now known as the Mapleton-Fall Creek neighborhood, the school had been in operation for more than three decades. 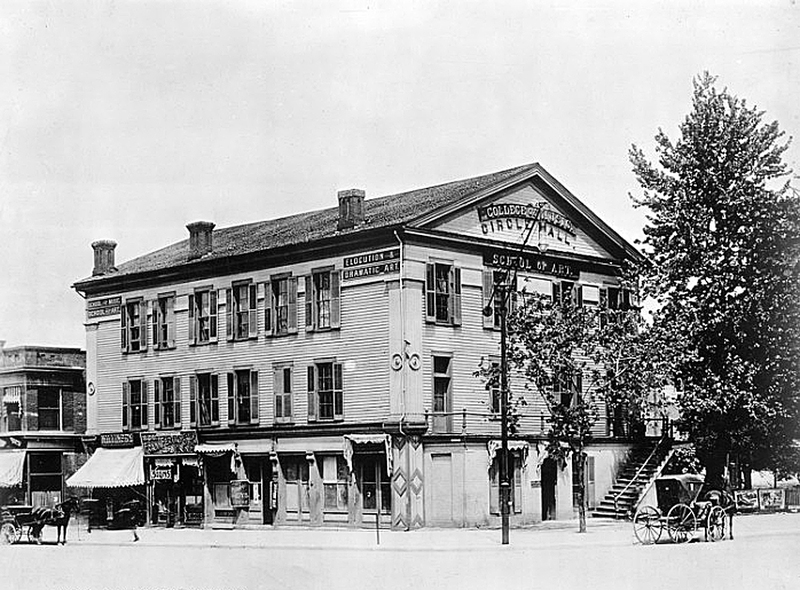 When it was established, the original entity was called the Metropolitan School of Music. It was founded in 1895 by four music teachers who had all been giving private lessons in Circle Hall. Circle Hall was the building in the northwest quadrant of Monument Circle where Reverend Henry Ward Beecher had preached from 1839 to 1848. Circle Hall was the building in which the forerunner of Second Presbyterian Church met. Circle Hall was also the original location of the Indianapolis High School, which held the first high school classes in the State of Indiana there in 1864; the secondary school was later renamed Shortridge High School. 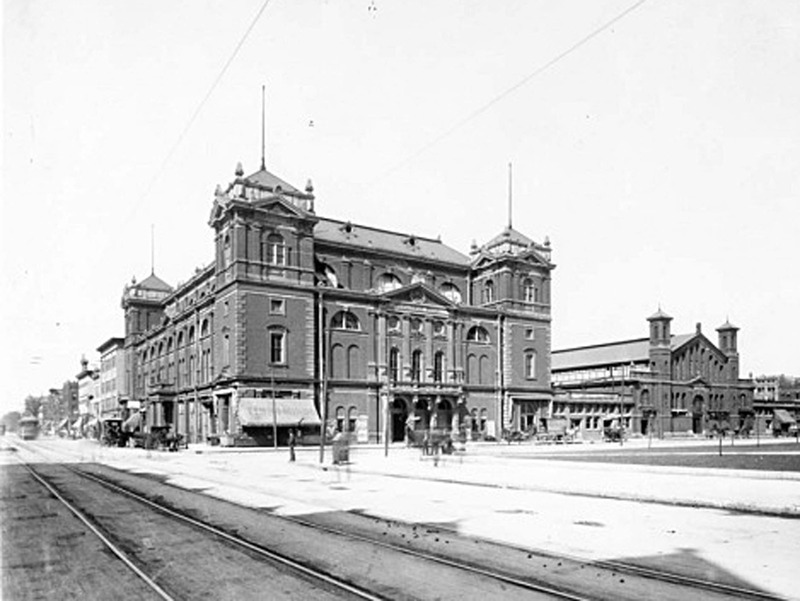 The music teachers who founded the Metropolitan School of Music were Franz X. Arens, Flora M. Hunter, Oliver Willard Pierce, and Richard Schliewen. The group became concerned about the poor condition of the aging Circle Hall, and they had differences of opinion with the manager there. 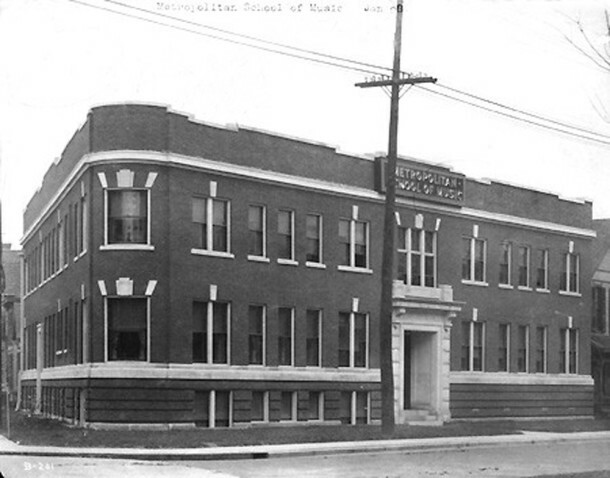 The operators of the newly formed school rented space in the early years of its operation — first at 232 and then at 535 North Illinois Street. Today those addresses are the locations of OneAmerica Tower and the Indiana Freemasons’ Hall. Piano, violin, and voice were the first three subjects taught at the school, but the areas of study were soon expanded. In 1907, the Metropolitan School of Music built its own freestanding building at the intersection of East North Street, North Pennsylvania Street, and Fort Wayne Avenue. Besides classrooms, practice rooms, and offices, the three-story, triangularly-shaped brick building also contained an auditorium called the Odeon (the Greek word for a performance hall). That same year, Oliver Willard Pierce left the school and founded the College of Musical Art, which was later renamed the Indiana College of Music and Fine Arts. It was located at 824 North Pennsylvania Street. 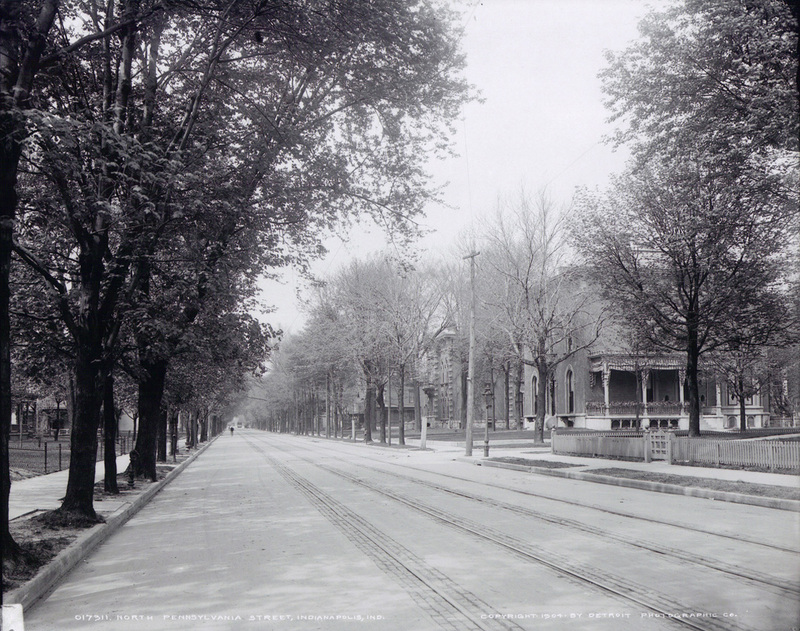 A few years later, it wound up being adjacent to the new Indianapolis Public Library on East St. Clair Street. For several years, the two music schools competed with one another for students and for funding. By the mid-1920s, the Metropolitan School of Music had 51 faculty members. 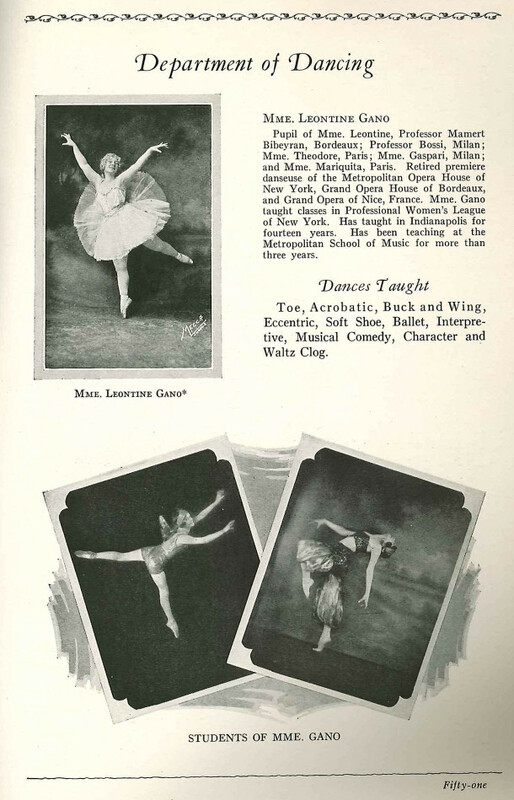 The courses being offered had expanded greatly and even included a department of dancing. An agreement was signed between the Metropolitan School of Music and Butler College of Butler University for the cooperative preparation of music teachers. 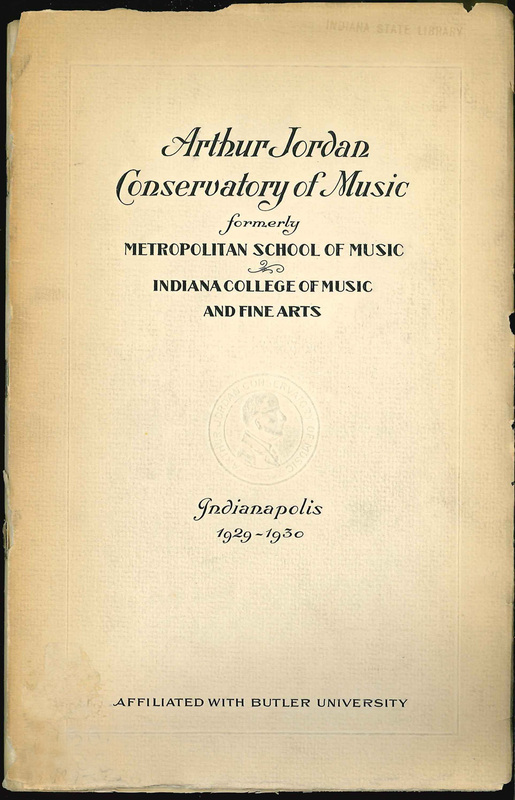 In 1928, businessman and philanthropist Arthur Jordan purchased both the Metropolitan School of Music and the Indiana College of Music and Fine Arts and consolidated them into the Arthur Jordan Conservatory of Music. Jordan had made a fortune in several different businesses, and he resolved to use his wealth to further educational activities. To that end, he established the Arthur Jordan Foundation, with assets valued at $2,000,000. Jordan had served on the boards of directors of Butler University, the Young Men’s Christian Association, and the President Benjamin Harrison Home, and all of them became recipients of his generosity. 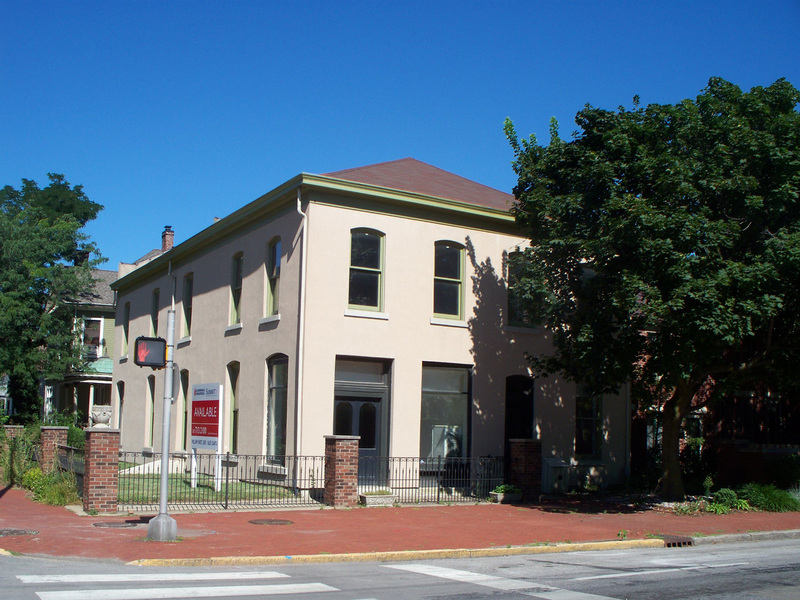 Arthur Jordan proceeded to buy the former residences of department store founders Hiram P. Wasson at 1116 North Delaware Street and Lyman S. Ayres at 1204 North Delaware Street, for the purpose of housing various functions of the music conservatory in them. In addition, a portion of President Benjamin Harrison’s former home was used as a residence hall for women students. 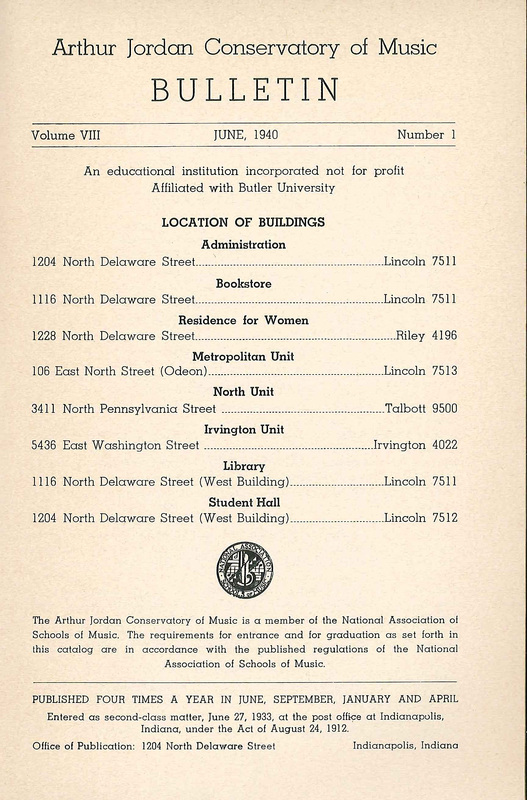 In 1940, the Arthur Jordan Conservatory of Music had facilities in eight different buildings! In 1949, Jordan dropped the title of “conservatory” and became the Jordan College of Music. The new name was deemed more appropriate, as the school had always functioned as a college. At that time, Jordan offered undergraduate degrees in piano, organ, orchestral instruments, voice, opera, composition, drama and speech, radio, dance, music merchandising, and musical education. Graduate degrees were offered in piano, organ, orchestral instruments, voice, composition, theory, musicology, and music education. In 1951, Jordan College of Music became a part of Butler University after a merger was approved by Butler’s Board of Directors. Jordan faculty and staff became members of Butler University faculty and staff, and past and future graduates of Jordan became members of the Butler Alumni Association. Butler continued to operate out of the various Jordan College of Music locations for a time, but a new building on the Butler University campus was planned to house all functions of the college of music. 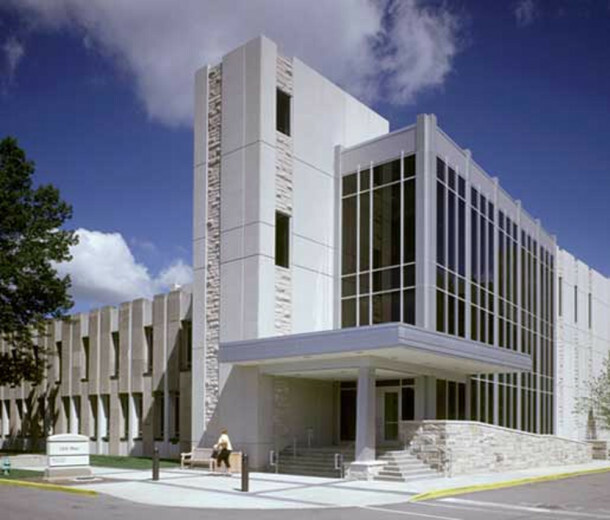 In 1963, Lilly Hall was constructed to be the new home of Jordan College of Music. 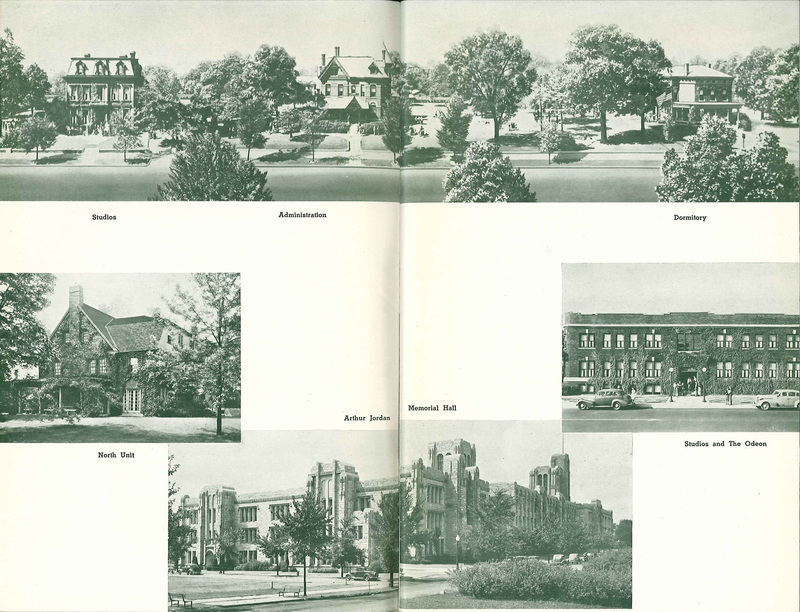 Most of the former Jordan College of Music buildings no longer exist today. The Metropolitan School of Music building at 106 East North Street is now a surface parking lot just north of the Minton-Capehart Federal Building at 555 North Pennsylvania Street. The Wasson family residence at 1116 N. Delaware Street was lost to the construction of Interstate 65, along with many other wonderful residences that were in the highway’s path. “The Ravages of the Road” was the subject of a Historic Indianapolis post last September, which you can read here. 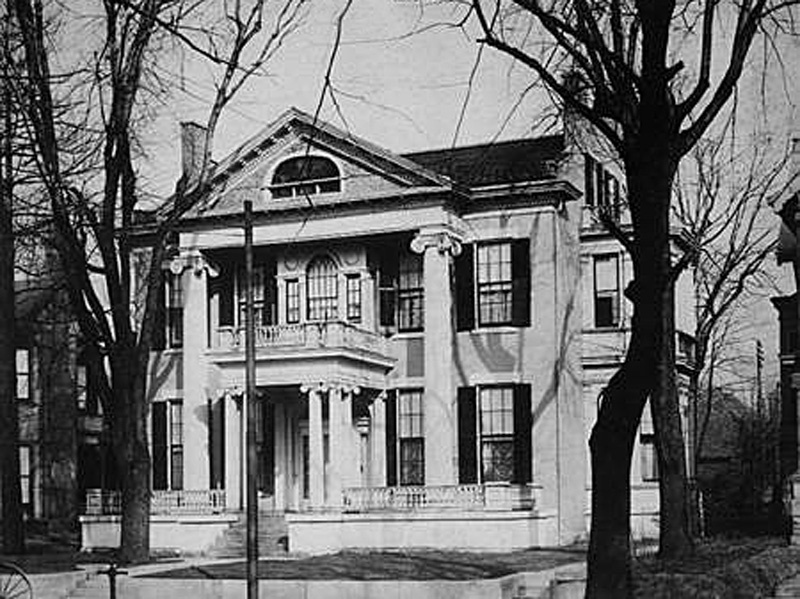 The Ayres family residence at 1204 North Delaware Street was also demolished and is now part of the south lawn of the Benjamin Harrison Home. 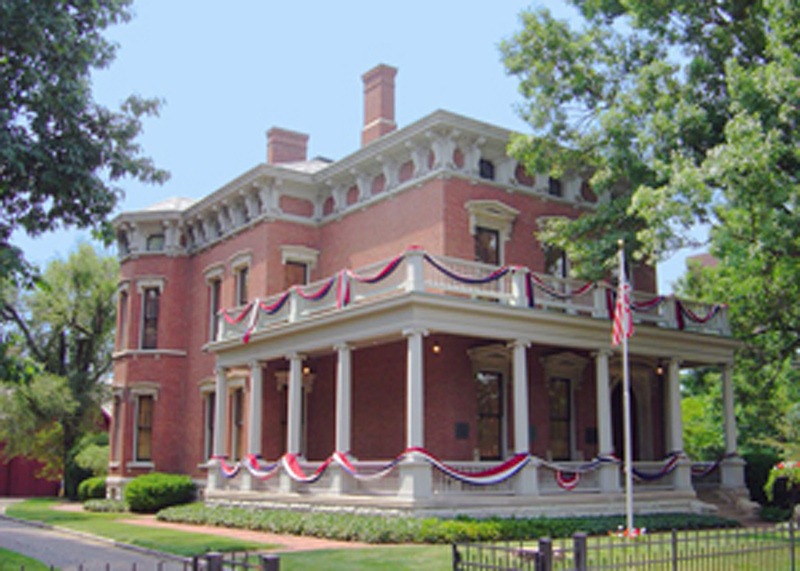 The former women’s residence hall at 1228 North Delaware Street no longer serves that purpose and is now the Benjamin Harrison Presidential Site. The former White family residence at 3411 North Pennsylvania Street is now a parking lot for Phillips Temple Christian Methodist Episcopal Church, which is immediately to the east of the property. The church was originally the home of Third Church of Christ Scientist. The Irvington location of Jordan, which was at 5436 East Washington Street, was replaced by a newer strip-mall type of building that currently houses a dental clinic. In 1978, the name of the school was changed to Jordan College of Fine Arts to reflect the broader range of subjects offered. In 2012, Jordan College of Fine Arts again changed its name to Jordan College of the Arts. There are now five academic departments on the Butler University campus, including art, arts administration, dance, music, and theatre. A one-minute video about the school can be viewed here. 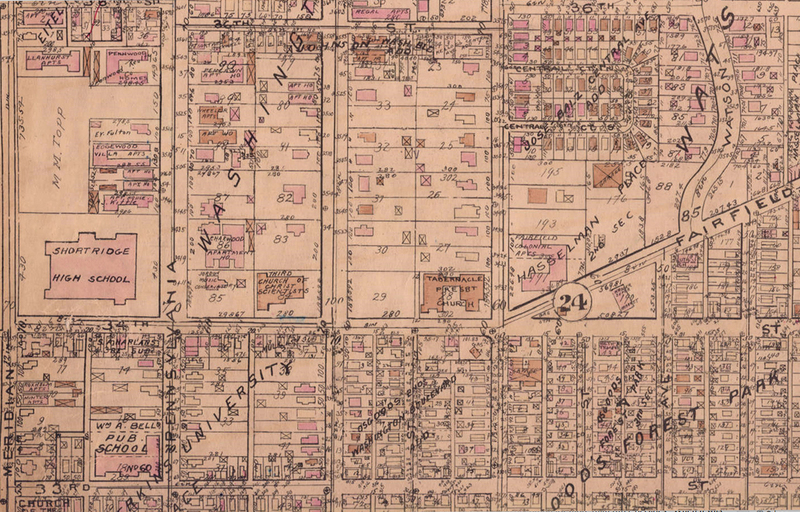 I lived on East 11th Street for about 2 years, beginning in the summer of 1938. Started school at Benjamin Harrison School 2 in January 1939 (at age 5) – I had to pass a reading test in front of the principal to be admitted at that age, and she put me in 1A. At any rate, in the summers I would walk up to Delaware Stree, sit on the grass plot across from Jordan Conservatory, and listen to the music, which was wonderful. Then I’d walk on up to the Presbyterian Church where I went to Vacation Bible School. Always treasured the memories. I spent my formative years at the 34th Street location, studying ballet or playing hooky from SHS. ! also remember classes at the “Odeon” in the summer, which I had been wondering if it it really ever existed. Perhaps I dreamed it. I spent so much time there and have no pictures. When I came back to Indy, everything was gone. I believe you got the two addresses backwards. Since Delaware is a one-way street going north, and taking into account the photo included of the three homes on Delaware (which are on the west side of the street), it would make sense that the numbers on the left would be lower, getting higher as the properties are farther north. Just thought you’d want to know. Oops! It’s been corrected, thanks for the catch. Your article about “Jordan” brought back a lot of very fond memories of my formative years in music. You also answered the question that I had pondered for years. “Whose home was that?” Now I know. 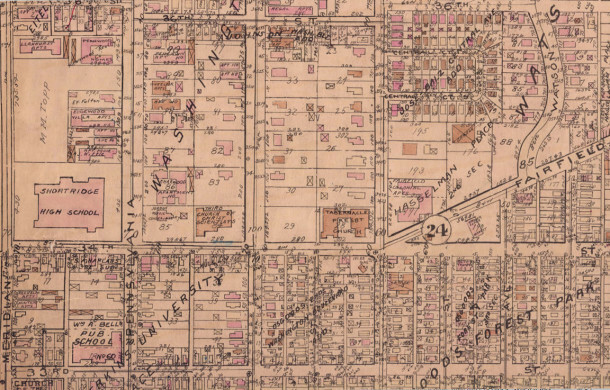 We lived at 17th and Central Avenue, and in my early teens I used to take the trackless trolley north to 34th and Pennsylvania Streets once a week for trumpet lessons at the “Jordan” (former Paul White home) located there. The lessons were held in a room on the second floor, and the instructor was a gentleman who played a five-valve euphonium in the Indianapolis Symphony Orchestra. After graduation from high school I became a “Jordan” student at Butler University. At that time, all of the classes for the “Jordan” Butler students were held at the “Delaware Campus” in the former homes of Hiram P. Wasson at 1116 N. Delaware and Lyman S. Ayres at 1204 N. Delaware. 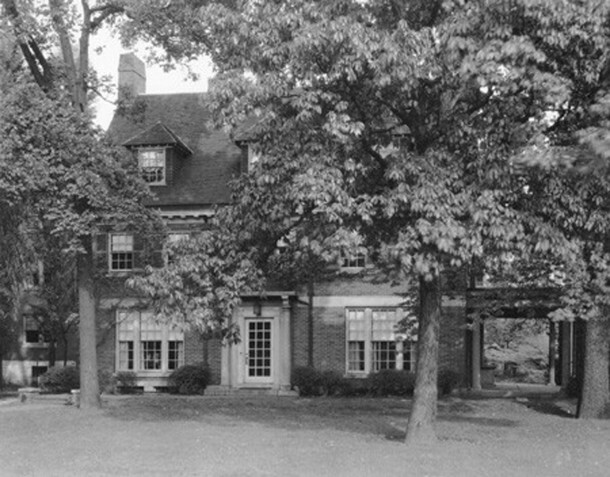 My trumpet lessons were conducted by Max Woodbury, a long time Indianapolis Symphony Orchestra trumpet player, in the large dining room of the Wasson home at 1116 N. Delaware. Piano and violin lessons were conducted in the L.S. 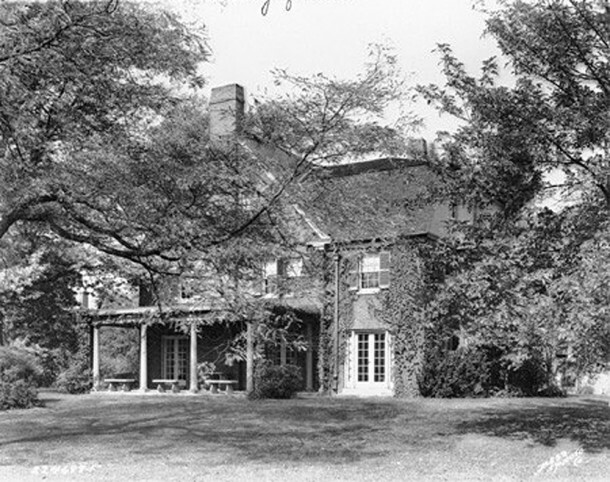 Ayres home at 1204 N. Delaware. 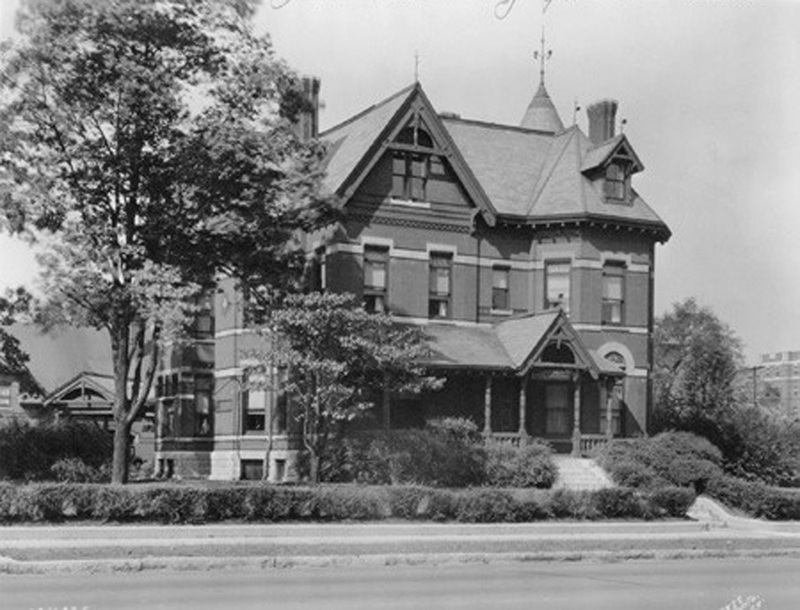 The Butler radio station WAJC was also located on the second or third floor of the Ayres home. I went there one evening with a friend to watch another friend take his turn at being a “disc jockey” of classical music. Music theory, English, and music history classes were held on the second floor of the carriage house located behind the Ayres home. There was a small restaurant, coffee shop, lounge for students and faculty located on the first floor of the carriage house. Very early in my music days, I also recall taking accordion lessons at the restored little gingerbread “Kemper” house located at 1028 N. Delaware. I also took piano lessons at the “Jordan” located in the “Odeon Building” at 106 E. North Street prior to my selecting the trumpet as my major instrument. Again, thank you for an excellent article. I only wish that I had had the foresight to take photos of the homes on Delaware, especially their interiors. Unfortunately, an opportunity missed. Great article, Sharon. And as a Butler grad, I really appreciated Les Gordon’s personal recollections of both the Ayres and Wasson homes when they were owned by Butler. I wrote about the demoliton of both houses last fall (http://historicindianapolis.com/indianapolis-collected-the-ravages-of-the-road/), but I didn’t have much information about how Butler was using the houses. Libby, I just added a link to your article within my post. I should have thought of that when I was writing mine (of course it was in the wee hours, so I was not thinking clearly). What a lovely article. I grew up in Indianapolis, where my father, Carl Dawson, was an IPS instrumental music teacher for 39 years. He received both bachelor (music education) and master (music composition) degrees from the Jordan Conservatory, and was always a little miffed when someone would say, “oh, you’re a Butler graduate.” Many people do not realize that the Jordan Conservatory had a pretty good reputation in those days (1930’s and ’40’s). I studied trumpet with Max Woodbury of the Indianapolis Symphony, who was also once on the faculty at Jordan, as well as Ball State and Indiana. I enjoyed this article very much. In the late 1930’s, I took piano lessons from Paul Linstead at the Arthur Jordan Conservatory, when it was located downtown at 106 E. North Street. And in the 1950’s, I taught biology at Shortridge High School, but until I read this article, I never realized that there had once been a Jordan campus across the street from Shortridge. My mother graduated from Bradley University in Peoria, IL and came to Butler for her Master’s in Music Education. She attended Jordan in the late 1950s and lived in the Benjamin Harrison Home. Students lived in what were the servant’s quarters at the back of the house. She said students lived there for free if they gave tours of the home and she gave maybe one tour the whole time. Her name was Jean (Ehlen) Cones and she taught music in Lawrence Township for 40 years. She was also a very fine pianist and accompanist. I found your site entirely by accident, and it brought back many memories. I took piano lessons at 3411 Pennsylvania in the middle 1950s; I remember my piano teacher was Earl Howe Jones. He taught in a room on the second floor, about where the staircase (to the first floor) stood. I suppose there are people who think a parking lot is a wonderful use of the land . . . . I also attended “Dancing School” (for manners, etc.) in one of the old mansions on N. Delaware, although I can’t remember exactly which house. It could have been the Ayres House, which from Google Streetview appears to be gone as well. Thank you for this site. It brought many memories for me. Hello. Great article. I believe my grandmother either went to school or taught music at the school on Delaware St. My mother couldn’t remember exactly and I’m curious to know which. She was born in 1907. Her maiden name Shook. I wonder if there are any archives available for me to research. I took the bus every week from around 38th and Sherman to take trombone lessons from the Indy symphony trombone players. For a pre-teen it seemed like a major journey. Later went to the new Jordan on the Butler campus, but I always like that house across from Shortridge. Many of my fellow band members went there as well and it was a springboard to all city orchestra. I found an “enrollment card” from the Jordan College of Music dated 6/14/57! This article was so interesting. I remember taking piano lessons and I think it was in a house – can’t tell you exactly where, I do remember the baby grand was on the second floor. I believe, if I remember correctly, that my teacher’s name was Mr. Contarsee – not sure of spelling. Anyone remember that name? He taught me some really difficult pieces, but at 11 years old, he scared me to death!! !